The Life of Brian - Must Have Group Policy Setting! Must Have Group Policy Setting! I recently blogged about time and how critical it is in a domain environment. Just this morning I read a post from the Directory Services Team that shows how to configure WMI Filtering through Group Policy to ensure that the PDC Emulator always has the right time configuration. You need to read through this post really consider implementing a similar policy into your environment. 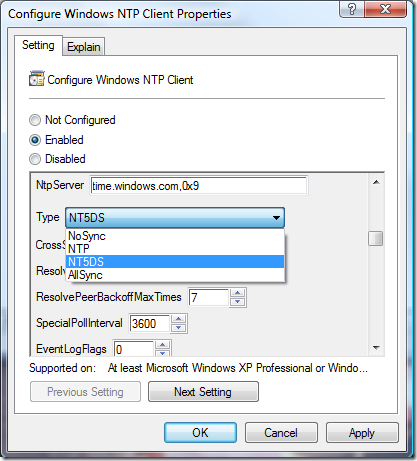 After you enable it you will want to change the default setting from NT5DS (which means find and sync with the PDCe) to NTP. This is because we are configuring this for our PDCe which should be pointing to a reliable time source (internal or external). You will also configure the location to that reliable source in the NTPServer dialog box. I haven’t seen a great tip like this in some time. This is one of those great little finds and I hope you enjoy it. Excellent! Perhaps it would be worth the little effort to create another GPO that sets all ”non-PDCEs” to use NT5DS? That is exactly what you will want to do to those other DCs. If this GPO applies the appropriate time settings (type=NTP, NtpServer=yourtimeserver) if/when the PDCe role is moved, what about the DC the role was moved from? Doesn”t there need to be a GPO in place that will change the Windows Time Service settings back to those appropriate for a non-PDCe? Yes it would be beneficial for you to have another policy that set the setting back to use NT5DS. This way you wouldn”t have to worry about configuring anything after a transfer/seize.